A very sweet thought for the New Year. Thank you, Fawn! My grandmother once said “When you start feeling sorry for yourself or feel yourself starting to complain, count at least ten blessings and the feeling will disappear”. I too plan on being more grateful this year. A lot of medical problems for my parents in 2014 and work and family issues for me but 2015 we’re looking at all the wonderful people and things we have in our lives and the many things we can still do. Thank you Fawn for a lovely post. Thank you, Fawn. The best resolution for any time of year. Even moment by moment. You’re right, of course, we’re all so lucky compared to so many others! 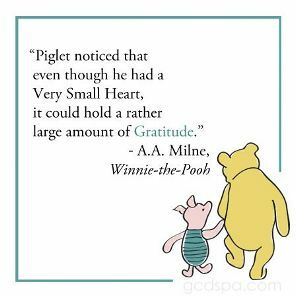 In addition to all of the things you listed, I am grateful for all the people in my life, this blog and its readers. You all are wonderful. I too think it is an amazing community of good spirited people!